Smith chased Westbrook’s John Peters in the early stages of the race, and once in front he was never seriously challenged, although it looked for a short while like former Beech Ridge champion Reid Lanpher of Manchester might provide a test, but a spin after some contact took Lanpher out of contention for the victory while battling Taylor for second spot. Taylor managed to hang on to second position in just his second appearance this year behind the wheel. Curtis Gerry of Waterboro, Maine rebounded from a bad heat race and almost going a lap down to Smith in the middle stages of the race to claim a third-place finish. Scarborough’s Garrett Hall arced among the contenders throughout the 150-lapper to end up in fourth place. Travis Benjamin of Belfast, Maine made up a lot of ground in the 2018 PASS North Super Late Model championship contest, posting a fifth-place finish while the points leader, DJ Shaw of Center Conway, New Hampshire, was relegated to a 22nd-place finish after being sent into the backstretch wall. Donnie Colpritt, Jr. of Scarborough, Trevor Sanborn of East Parsonsfield, Alan Tardiff of Goodwins Mills, Lanpher, of Manchester, and Windham’s Brandon Barker rounded out the top ten. Waterford’s Spencer Morse, in just his fourth appearance in the class, came up one spot short of scoring his second victory, racing right on Whitten’s rear bumper as they flashed under the checkered flag. Helmuth ended up in third position, with Gary Shackford of Center Conway, New Hampshire and Stetson’s Wayne Allard filling out the top-five rundown. Terry Merrill of Saco came out on top in a highly-competitive, wildly-entertaining 50-lap race for the Beech Ridge Sport Series regulars. Merrill stalked an intense battle in front of his machine for most of the race, as first Scarborough’s Charlie Sanborn III and then Devin Curit of Saco waged intense battles for the lead with newly-crowned Sport Series champion Joe Pastore of Gorham. Durham’s Kenny Harrison and Sanborn rounded out the top five. Sanborn and Pastore were the heat race winners and they waged a side-by-side battle for nearly 15 laps to open the main event. 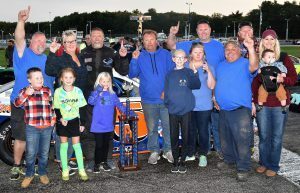 Billy Childs, Jr. of Leeds outran the competition in a special 50-lap open race for Oxford Plains Speedway Street Stocks, Beech Ridge Wildcats and other similar racing divisions. Childs chased Buckfield’s Kyle Treadwell for almost half the race before outrunning Gray’s Tyler King to the checkered flag. Treadwell’s third-place finish finished off a podium sweep for the invaders, with Adam Lovejoy of Sanford best among Beech Ridge weekly racers in fourth place. Greene’s Zach Bowie rounded out the top five. Lovejoy and Treadwell won 10-lap heat races.